Hundreds of candles lining the walkways and porch in front of Gurdwara Sahib Guru Nanak Dwara in Phoenix, AZ, cast a warm glow upon delighted young faces. Little children carefully and reverently carry their very own candles to place before the Guru, while their older brothers and sisters light their candles one from the other. The colors and lights create a feast for the eyes, while on the back patio a feast of flavors has been set up to celebrate the wondrous occasion of Bandi Chhor Divas – Prisoner Liberation Day – when the sixth Guru, Guru Hargobind, was liberated from Gwalior Fort and took 52 prisoners to freedom along with him. The occasion of Bandi Chhor Divas first took place in autumn of 1619 and is currently celebrated in October or November; the date changes according to the lunar calendar. Guru Hargobind’s father, Guru Arjan Dev, had been martyred almost 13 years before, and the Mughal authorities were carefully watching the young Guru. When he constructed the Akal Takht, the Throne of the Almighty, in Amritsar and concurrently strengthened his army, the Nawab of Lahore, Murtaja Khan, grew alarmed and informed the Mughal Emperor Jahangir. The Nawab conveyed his fear that the Guru might be planning to avenge the death of his father. Jahangir at once sent Wazir Khan and Guncha Beg to Amritsar to arrest Guru Hargobind. Wazir Khan, however, was an admirer of the Guru; instead of arresting him, he persuaded the Guru to accompany them to Delhi to meet the Emperor. Even though Jahangir had ordered the execution of his father, the Guru accepted the invitation and journeyed to the Emperor’s court. When Emperor Jahangir met the young Guru, he was captivated by his charm and purity of spirit. He queried him as to which religion was better, Hindu or Muslim, to which the Guru quoted lines from Kabir proclaiming that the One Lord is within both Hindus and Muslims. The Emperor was entranced by the Guru’s wisdom and prepared a royal reception for him, after which he invited the young Hargobind to accompany him on his shikars or hunting expeditions. During one of these hunts, the Emperor and his party were tracking a lion which had been terrorizing a village. Without warning, the lion burst from the bushes and charged at Jahangir. Desperately, the other hunters fired their weapons but failed to stop its attack. At the last moment, Guru Hargobind jumped in front of the beast, yelling that it must deal with him first. Raising his shield to deflect its jaws, as it leapt in the air he thrust his sword into it, killing it with one powerful stroke. The animal fell dead at his feet. Guru Hargobind had saved the Emperor’s life. The Guru and the Emperor became good friends, but this only provoked the jealousy of others who wanted the Emperor’s favor for themselves. One of these was Chandu Shah, a rich banker, with influence in the court. After first rejecting Hargobind as a match for his daughter, he later changed his mind and sought the arrangement. Having learned of his previous remarks, Guru Arjan Dev refused the proposal. Chandu Shah had been influential in arranging Guru Arjan’s death and now focused his wrath on his son, Guru Hargobind. While in Agra, the Emperor became very ill. It seemed that nothing could cure him. Chandu Shah cornered the court astrologers and convinced them to tell the Emperor that his illness was due to an inauspicious alignment of the stars which could only be cured if a holy man were to go to Gwalior Fort south of Agra and offer prayers for his recovery. Chandu Shah innocently suggested that there was no one more fit for this precious task than Guru Hargobind. Thus, at the Emperor’s request, the Guru agreed and left for the Fort with several companions. Rather than being a sanctuary of tranquility, Gwalior Fort was really a prison where enemies of the state, including a number of Rajput princes, were detained. True to his nature, the Guru inspired them to join him in daily prayers and did his best to improve their conditions. In time they came to revere him. The governor of the fort, Hari Dass, was a Sikh of the Guru and turned over to him a letter from Chandu Shah ordering him to poison the Guru. After the Guru had been in Gwalior Fort for several months, his Sikhs, including the ancient Baba Buddha, made the long journey from Amritsar to tell him how greatly they missed his presence. Although the Emperor had recovered, still the Guru was held captive. At this time, Mian Mir, a noted Sufi saint, traveled to the Emperor’s court and asked him to release the Guru. Upon his persuasion, the Emperor ordered Wazir Khan to free the Guru. Hari Dass informed the Guru of this fortunate turn of events; however, the Guru could not embrace his own fortune at the expense of the other prisoners and refused to leave the fort until all 52 of the Rajput princes were freed as well. When the Wazir Khan put the Guru’s condition in front of the Emperor, he initially refused it. It was only when the Wazir Khan reminded the Emperor that the Guru had saved his life that he relented. He added a condition of his own: in order to be released from the fort, each prisoner must be holding on to the Guru’s cloak as he walked out of the prison gates. The Emperor was pleased with himself because he was sure that a mere handful would be able to fulfill this condition. Unbeknownst to him however, the Guru delighted in this challenge by having his tailor make a special cloak with a very, very long train to which were tightly attached 52 tassels. At the appointed time, the Guru donned the heavy cloak and his friends laid out the train, which stretched for yards behind him. The 52 princes picked the cloak up and grasped their tassels; 26 on the right and 26 on the left. Walking behind the Guru, careful not to let go, they stepped out into the sunlight and freedom, to the cheers of the Guru’s Sikhs. From this time on, Guru Hargobind was known as Bandi (prison) Chhor (liberator), and the day of liberation is celebrated as Bandi Chhor Divas (day). 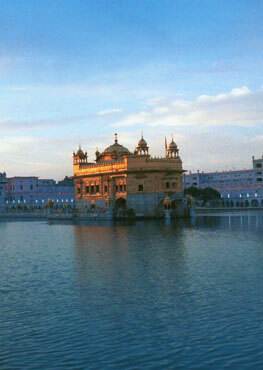 Several days later, when Guru Hargobind reached Amritsar, the Hindu festival of light, Divali, was being celebrated. In their joy at seeing their Guru again, the people lit up the whole city with candles, lights, and lamps. After almost four hundred years this tradition continues in Amritsar, and on this day the Harimandir Sahib is aglow with thousands of candles and floating lamps, strings of lights decorate the domes, and fireworks burst in the sky. Elsewhere, at Gurdwara Sahib Guru Nanak Dwara in Phoenix and around the world, Sikhs commemorate Bandi Chhor Divas, Prisoner Release Day, by lighting hundreds of candles in the evening around the Gurdwara, singing shabds in praise of Guru Hargobind by Bhai Gurdas, preparing a festive Guru ka Langar, and basking in the spirit of joy and festivity.